Starting the Bangkok Motorbike Festival (BWF) 2016 event on Wednesday, January 27, 2016. 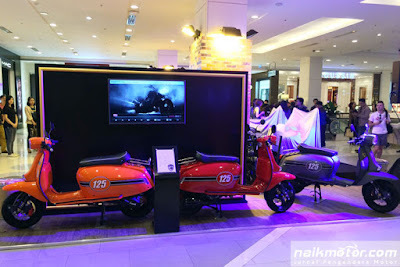 A British retro-styled scooter brand, Scomadi Ltd. presents Scomadi Turismo Leggera (TL) 125 that has a priced around US $2,700 to $3,100 or approx Rp.37 million to Rp.43 million. Scomadi Ltd. is a British company founded in 2005 as the results of a joint venture between Frank Sanderson of Scooter Innovations Ltd. and Paul Melici of PM Tuning Ltd., which has more than 60 years experience in the scooter industry. 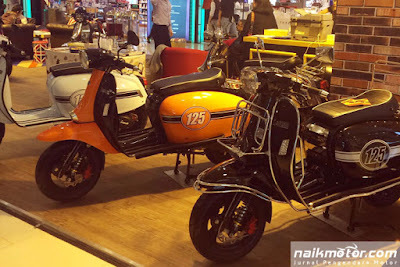 They created the 'Scomadi' brand and making various scooters which refers to the Italian style of the past. And the Turismo Leggera range represents the culmination of 10 years of prototype development. Utilising the experience of PM Tuning Racing Products & Scooter Innovation, Scomadi are aimed at providing a new era in scootering for followers of iconic Italian design. The Scomadi TL125 which says made in China using a 4-stroke 125 cc engine that has the Euro3 emission standard. Those engine could burst the power up to 9.9 hp @ 7,300 rpm and torque of 9.67 Nm @ 7,200 rpm. While its body made of carbon fiber materials which is beautifully embedded in the top of a tubular chassis. A cross between a tubular chassis with carbon fiber body panels make Scomadi TL125 has an empty weight of 100 kg. Applying the double hydraulic pre load adjustable shock absorber with coil spring with anti dive linkage system in the front and Coil spring with adjustable preload (4 positions) hydraulic shock absorber, those suspention systems became the backbone of the user riding convenience. Modern aura also implied through the adoption of brake disc devices with the dimensions of 175 mm (front) and 220 mm (rear).